Most of the rural population of Africa do not have access to safe and reliable toilets. A good toilet, together with a safe reliable water supply and the practice of good personal hygiene, can do much to improve personal and family health and wellbeing. There is an urgent need for the construction of simple, low-cost, affordable toilets that are easy to build and maintain and are relatively free of odours and flies. This book attempts to provide practical information which will allow those living in rural, peri-urban and even some urban areas of Africa to build and practice the art of recycling nutrients from their own excreta in order to gain better crops and vegetables in their own back gardens. The work is primarily intended for use in East and Southern Africa, where there is space, where backyard gardening is practiced and where the climate is warm and wet seasons are interspersed with dry. 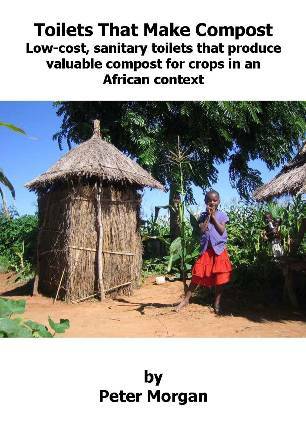 Included inside this book are detailed descriptions of how to make a range of low-cost, sanitary toilets that also make compost. *New* Search inside the book directly! Peter Morgan at the launch of the French version of his book "Toilets That Make Compost" at the NETSSAF Conference in Burkina Faso, September 2008.